Drawing of the 1905 Lewis and Clark Centennial Exposition on view in Pittock Mansion’s West Dressing Room. Click for larger view. In the late 1800s and early 1900s, cities across the globe hosted elaborate “world’s fairs” to promote progress and showcase the industrial might, products, arts, and culture of their region and the world. 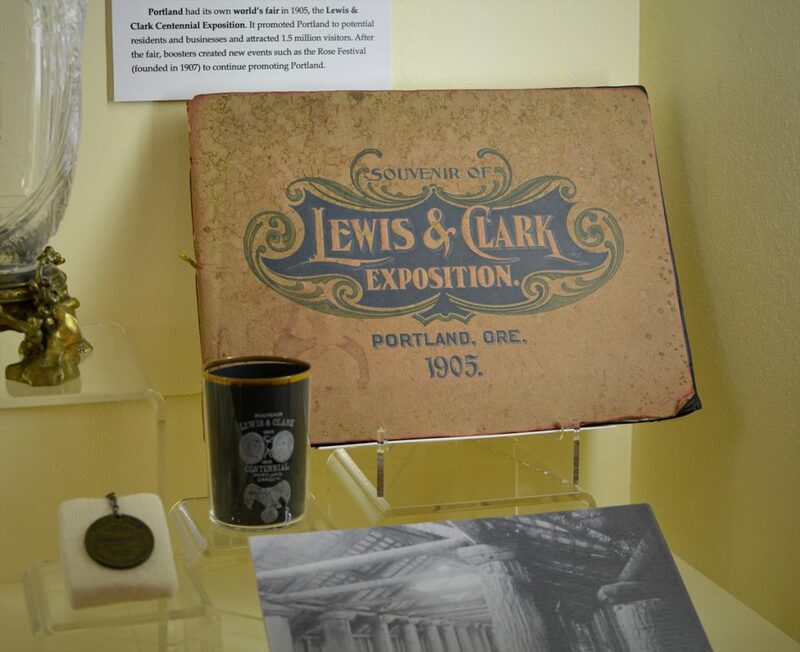 In 1905, Portland held its own world’s fair, the Lewis & Clark Centennial Exposition–named in honor of the 100th anniversary of Lewis and Clark’s arrival in Oregon–to promote Portland to potential residents and businesses. 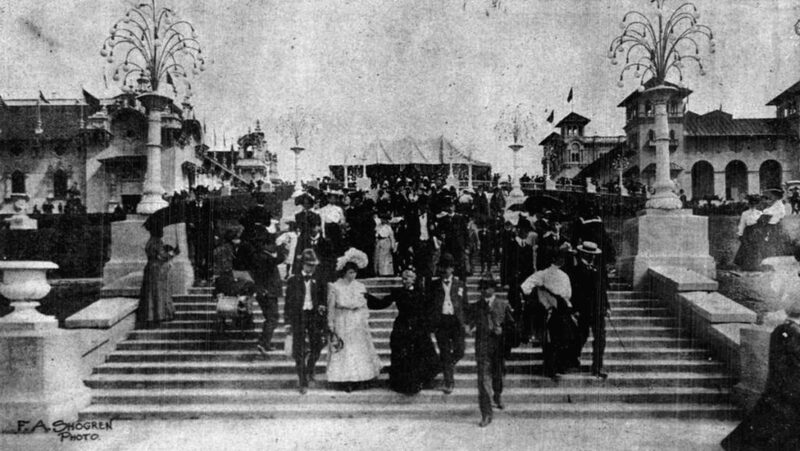 The Exposition ran June through October and attracted 1.5 million visitors­–a huge number, considering Portland’s population was about 120,000 at the time. Lewis and Clark Centennial Exposition Grand Opening. Photo courtesy of the Morning Oregonian. The full name of the Exposition was the “Lewis and Clark Centennial and American Pacific Exposition and Oriental Fair,” emphasizing Portland’s proximity to Asia and its wonders. In addition to exhibits from Japan, China, and India, European countries like Italy and France participated, as well as states from Oregon to Maine. Other exhibits highlighting advancements in agriculture, technology, and the arts educated visitors, while blimps, hot air balloon rides, “moving picture shows,” trained animals, and performances entertained them. Left: Dancers from Kiralfy’s Carnival of Venice at the Lewis and Clark Centennial Exposition. Photo courtesy of University of Washington Libraries. Right: A crowd marvels at a blimp. Photo courtesy of The Morning Oregonian. Pittock Mansion overlooks the former Exposition site along the Willamette River in Northwest Portland. 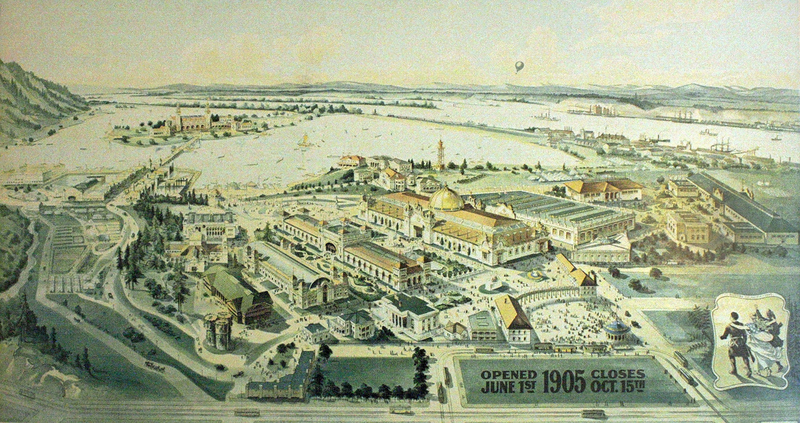 Exhibition organizers built grand-looking but temporary buildings around Guild’s Lake and on an artificial peninsula. After the Exposition, developers tore down most of the buildings and filled in Guild’s Lake. The area first became a railroad switching yard, then wartime housing, and in the 1950s, became the industrial district we know today. The Foreign Exhibits Building. Photo courtesy of the Official Catalogue of the Lewis and Clark Centennial and American Pacific Exposition and Oriental Fair. 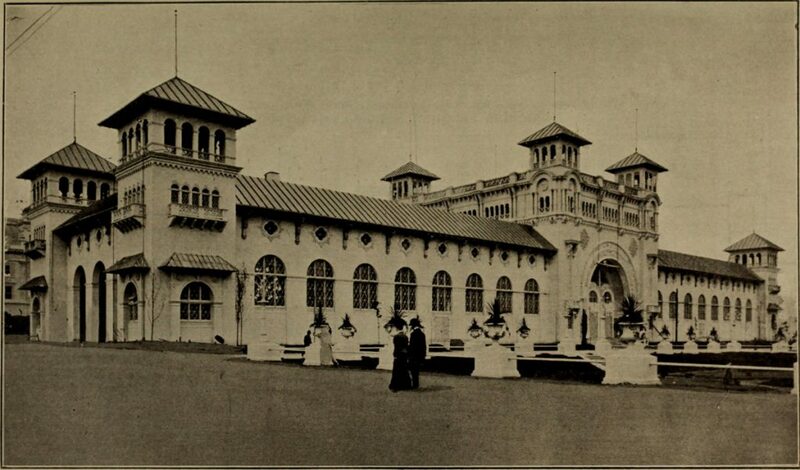 A handful of the Exposition’s buildings survived. The Fairmount Hotel still stands at its original location, while the American Inn was relocated closer to downtown. The National Cash Register Building was moved to the St. Johns neighborhood in North Portland and is now the McMenamins St. Johns Theater and Pub. The Forestry Building, dubbed “the world’s largest log cabin,” was a showcase for the timber industry until it burned down in 1964, leading to the construction of the World Forestry Center in Washington Park. Left: The Forestry Building exterior. Photo courtesy of the City of Portland Archives. Right: Forestry Building interior during the Lewis and Clark Centennial Exposition. Photo courtesy of the Library of Congress. Captivated by the Lewis and Clark Centennial Exposition? Check out our current exhibit, Untold Stories of Pittock Mansion Treasures, which includes souvenirs from the Exposition such as fair albums, postcards, drinking glass, plate, and commemorative medal. Souvenirs from the Lewis & Clark Centennial Exposition.